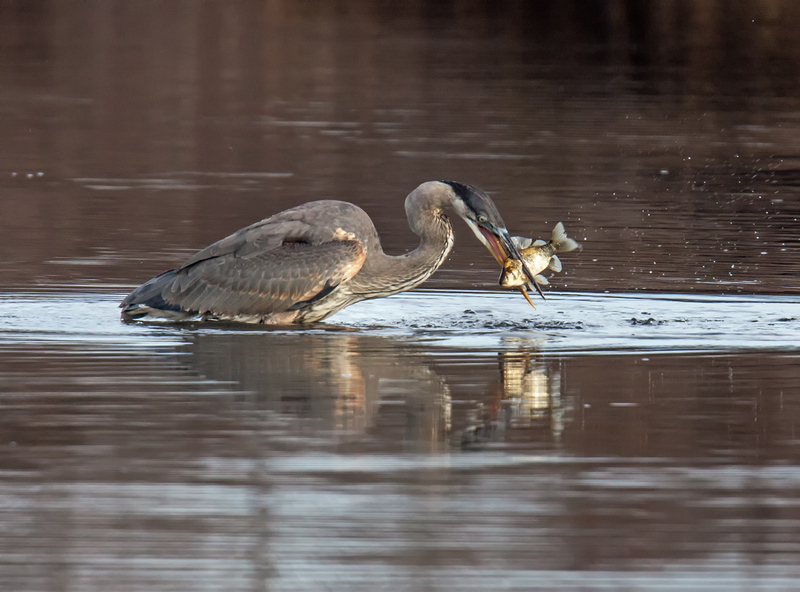 After several unsuccessful attempts, this Great Blue Heron (Ardea herodias) pulled a good-sized fish out of the waters of a small pond on Monday at Occoquan Bay National Wildlife Refuge. 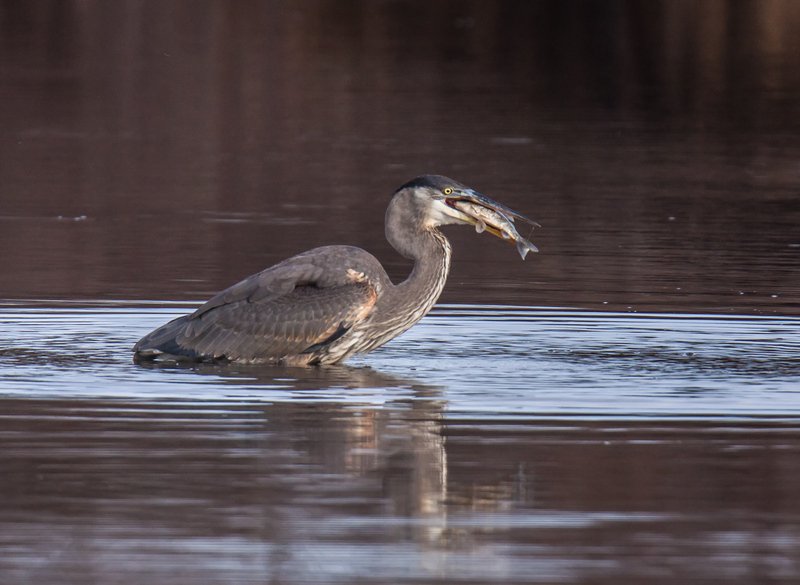 A few second later the heron had the fish correctly positioned and swallowed in a single big gulp. I thought the heron would take a break to digest his meal, but it returned immediately to fishing. Great Blue Herons have an amazing amount of patience. They will stand immobile for extended periods of time and then strike forcefully into the water without any notice. When I am observing a heron, it is always a challenge to remain alert and ready. Often the heron’s patience exceeds my own, but fortunately that was not the case on this particular day. I was lucky too that the heron did not turn away after it had caught the fish, which allowed me to capture some of the action. Lucky shots indeed! Thank you for sharing. Nice Mike! It is fun to watch them fishing. And it amazing how large a fish they can actually swallow. One time I saw one that had some trouble but after half an hour it did get it down! Well, you have the patience of the Great Blue! Thanks for an amazing photo. Fascinating photos! Bird and fish are both very photogenic. Very nice action set, Mike! It’s interesting that the GBH can feed in water that is so deep. We usually see them just up to their “knees” when they hunt. This one was wading about and wandered, I think, into somewhat deeper water. When it struck, it seemed like it kept its head underwater longer than normal.